Thanks to all who have left comments in my absence - Barbara, I suspect that part of our energy savings with the stove top kettle is the fact that gas is still cheaper than electricity - but on the other hand, a stove top kettle still does not heat up as rapidly as plug-in electric kettle would (those are the energy guzzlers, the things that heat up really rapidly), so I would imagine that you'd still save money by switching. Don't just take my word for it though, do a bit more research first..... Or try taking an electric metre reading before and after boiling a kettle, and then before and after boiling the same amount of water in a saucepan with a lid - the energy use of a stove top kettle will be similar to the latter. As for the kettle itself - I just had to get a new one I'm afraid (after a couple of years, the lid on the old one fell apart - I held it together with superglue for a while, but a replacement was needed asap) - it's this one. Baking bread. The cheese and onion loaf was a hit - why does it always happen with the stuff I create to use up random imgredients that have been hanging around for yonks ? In this case, dried onions - all gone now. Dealing with the last of the pumpkin flesh - cubed, roasted, frozen. Marvelling at the garden mid-November - I've never seen it look so - well, floral - this late in the year. Not to mention the sunshine. It does mean that windows need to be kept clean though..... Not usually an issue this time of year ! A lovely autumn post Allegra. 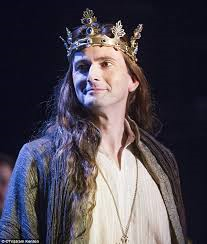 Lucky you getting to see Richard II.